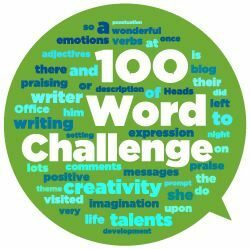 100 Word Challenge is popular with many bloggers. Perhaps you have heard of it but you’re not exactly sure what it’s all about? Perhaps you’ve taken part before and you’re interested in the background of the project? 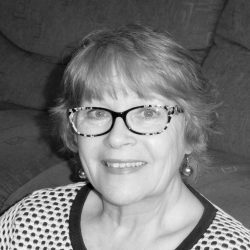 To find out more about 100 Word Challenge, we have interviewed the founder and organizer, Julia Skinner. 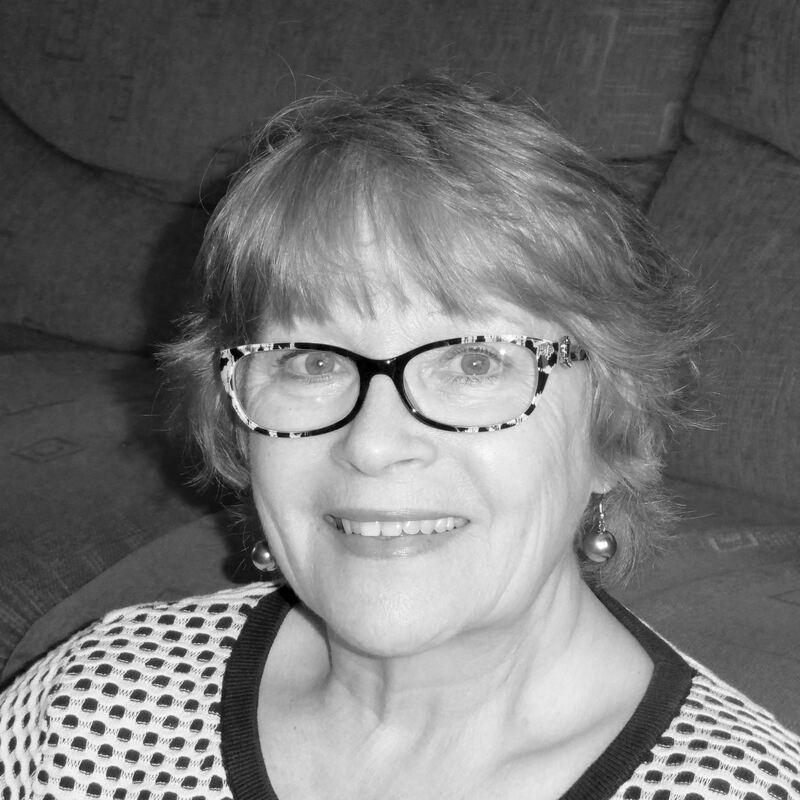 Julia is a retired head teacher from England. She still has her feet firmly planted in education and is inspiring teachers and students worldwide. 1) How did 100 Word Challenge come about? I had set up a new blog The Head’s Office and was looking for a way to get more visitors. I did a similar writing challenge as an adult with an American blogger and thought it would be good to develop it for children. I had hoped that I’d get say, 30 posts each week, but it is now nearer 600! 2) How does the challenge work? I set a weekly prompt on 100wc.net. That can be a few individual words, part of a sentence, or a picture. Students respond to the prompt by producing a creative piece of writing as near to 100 words as possible. I don’t count them (!) but the challenge is to keep as near to the wordage as possible. These pieces are published on a blog then linked to 100wc.net. Once there, my team of volunteers from across the world visit posts and leave a supportive comment. 3) How can classes get involved? Firstly, you need a simple blog. (Tip: check out our quick start guide to setting up your free blog). 100WC is free to enter and is aimed at students under 16 years old. Teachers sign up by clicking JOIN on 100wc.net. That puts you on the mailing list for the weekly newsletter. Once you have published a post on your blog, just link the URL of your post onto the form on 100wc.net. You’ll find the step-by-step instructions along with screenshots on the 100 Word Challenge site. 4) What benefits have you seen participants get out of 100 Word Challenge? As writers, we want someone to read our work. Team 100 provide that extended audience beyond the classroom. For many students, getting a comment from across the world is really motivating. They want to write and be better each time. Members of Team 100 send me nominations for our weekly showcase. This is a special page on 100wc.net and if your post is chosen you get a certificate and special badge for your blog. Classes can also join a hub. That is 3 classes from across the world linked together to support each other with comments. Some of these connections have extended into other areas of the curriculum and Skype sessions. 5) Can you describe the difference between 100 Word Challenge and 5 Sentence Challenge? 5 Sentence Challenge is for emerging writers. That can be young writers who are just starting out, or older students who are learning English. 5 Sentence Challenge is run in the same way by publishing on a blog then linking to fivesc.net but because it is likely to need more discussion, this challenge is every two weeks. 6) If you don’t currently have a class, are there any other ways to get involved? Individual students can take part. All you need is a simple blog. For adults wanting to get involved the best way to do it is to join Team 100. You will be given a minimum of 5 posts to comment on each week. You can find details on the Team 100 page of the 100 Word Challenge site. As we offer a big thanks to Julia for helping us learn more about 100 Word Challenge, we also invite you to ask further question in the comments and we’re sure Julia would be happy to get back to you. Alternatively, if you’re a participant of 100 Word Challenge we’d love you to comment with your experiences so others can learn more about the benefits of getting involved. Great ideas! You can definitely take part even if you don’t have one to one or if everyone doesn’t have a blog. A lot of teachers just have a class blog (and sometimes they only use it for 100WC). Then they publish student work on there (either all the students’ work, or handpick as you say). So it’s pretty flexible. 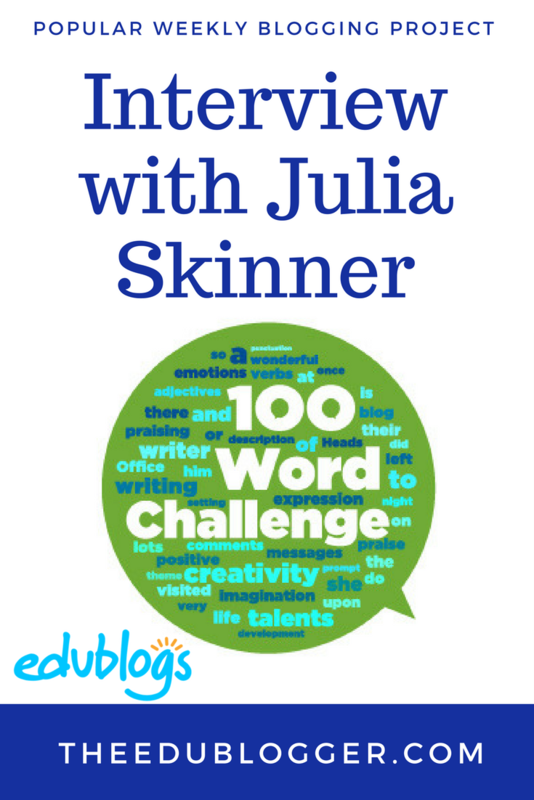 Julia Skinner here, founder of 100 Word Challenge. You only need one blog per class. If the students are signed up to be contributors on the blog they can post & publish as individuals but on the one blog. Once they have published their post, if it is linked to the form on 100wc.net, they will then have the chance of comments from across the world plus the opportunity of collaborating with other classes. Does that all make sense.? Thank you for the information. I want to pass this along to my teachers. I have just signed up to take part with my pupils. Do the pupils write their 100 words on our blog post comments and then we link them to the site? Or do pupils complete the 100 WC and then the teacher writes a post with their 100 words? Just looking a little clarity. Hey Kathleen, this isn’t about the blog, but nobody has been commenting on my blogs so I just want someone to comment on them. If you don’t want to or don’t have the time I understand. Unfortunately it looks like your site is down? Also, if you click on the page that says October 2017 students, you’ll see a list of students who have just completed the challenge. You could visit their blogs and leave a comment. You might like to tell them about your site too. Hope that helps! I would like to thank Kathleen for having allowed me to know 100 Word Challenge and to thank Julia for having invited me to participate. It has been ever since a source of learning English from young students and an experience of deep joy by appreciating and commenting on young writers’ posts. This is fantastic to hear, Ines! Many thanks for all your support for 100 Word Challenge. It has been great to work with you and hopefully 2018 will see even more collaboration between us. For sure! We really appreciate the work you do in the education community. The fantastic thing about 100wc is even the newest blogger can dip their toes in. As you wrote recently, you don’t need to have bells and whistles on your blog to reap the rewards of an authentic audience. An example that springs to mind is George Couros. He is one of the most prolific educational bloggers out there with a huge following. Yet the format of his blog is quite simple. People are simply drawn to his words! Hi Julia! I am a 8th grader at Northern Lebanon school district in Fredericksburg PA. My friend and I run a blog called Anonymous Advice for all of the kids in our Middle school. We are always looking for new ways to get people interested in our site. We aren’t greedy or anything, and sincerely want to help the kids at our school. We have just read your article about the 100 word challenge. We think it would be really fun to do something like this on our site, bring the fun of competition and the joy of becoming a better writer. Do you think this is a good idea? We would never use any of the prompts you had come up with and we’d give credits to you for the idea. Like I said, we’d like to do something similar to this, with all credits given to you of course. Would you be ok with this idea? I’m glad you like 100WC. It is a little more complicated than it might seem! Apart from setting the prompts, I hold a database of classes & send a newsletter every week. I’m available virtually 24/7 for any queries. I run the weekly showcase which involves contact & publishing midweek. The key to its success is the comments that come from Team 100. This is a group of 300 that I organise to make the comments that motivate the students. There is quite a bit of organisation that goes into allotting numbers, putting them into team &following up. I hope you can see that it is more than just setting a prompt ut do get back to me if you would like more details.